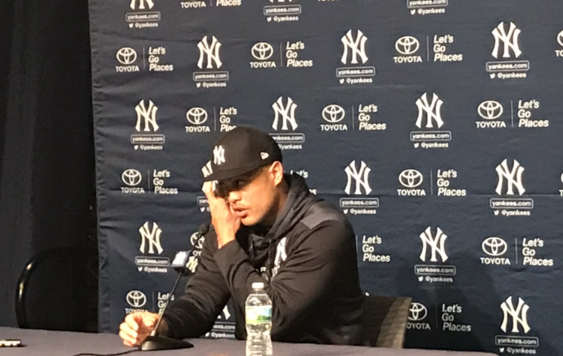 Giancarlo Stanton during his press conference on Wednesday. All photos by Jason Schott. Giancarlo Stanton experienced everything possible in his first year with the Yankees: excitement when he was acquired, boos from the home crowds on Opening Day and well into the season, followed by an up-and-down performance as he got adjusted to the American League, and concluding with a tough playoff series against the Boston Red Sox. Stanton came to the Yankees from the Miami Marlins, where he played his entire career, in a surprise trade in December 2017 when the was the reigning National League Most Valuable Player. As would be expected with a change in leagues and cities and going from an also-ran to the pressure of a contender, his numbers dipped, from 2017, when he hit .281 with 59 home runs and 132 RBI, to a .266/38/100 slash line in 2018. But with New York, there is so much more that factors in. "Solid learning experience last year," Stanton said on Wednesday, and added, "It's just the newness of everything, it's just an adjustment over all, so, but this is a game of adjustments, and this is what we constantly have to do to be successful through the years." Giancarlo Stanton taking some swings on Wednesday. 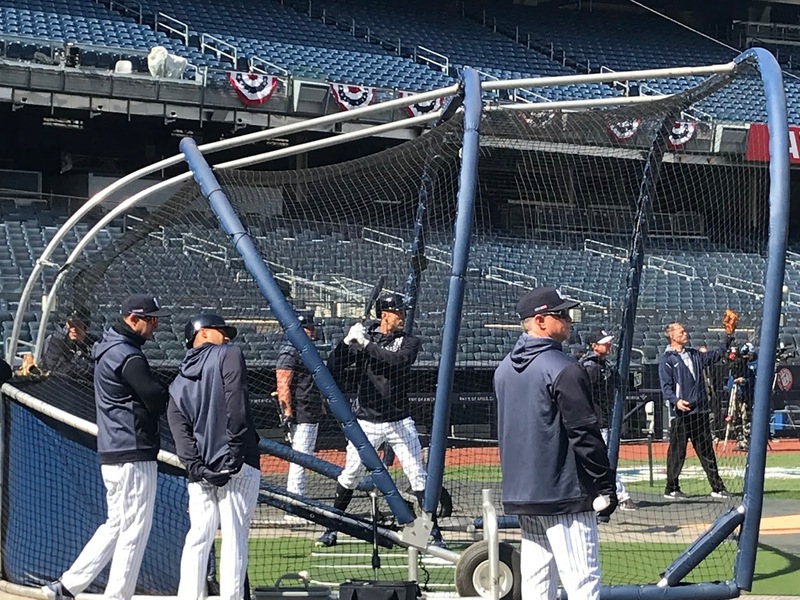 On what he expects in Year Two with the Bronx Bombers, Stanton said he will "have a little more idea of what to expect and just the dynamic of our team, how our lineup comes together and how to create opportunities." Stanton's first experience in the playoffs was their Division Series loss to Boston, in which he was 4-for-18 at the plate in the four games. On what he learned from it, he said, "I mean, we didn't get to where we wanted to be, so we all have that ultimate goal, that kind of bad feeling in our stomach from how it ended, so that's gonna creep in all season and be ready when the next time comes." Stanton speaking to the media Wednesday. 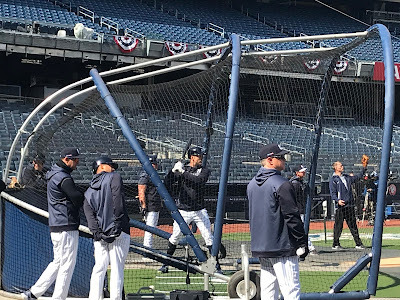 Yankees Manager Aaron Boone said of what Stanton can do to be more consistent this season, "Sure, I think that G, as you guys have learned, he's a a worker, he gets under the hood, he studies, he really studies pitchers, and I think, as I've talked with you guys a lot, over the years, or over the last year, he does really well the more he sees somebody. more so than most guys, so I think he's able to process information when he gains experience against a guy, so I think another year, a second year of being in the American League, of being in the American League East, maybe just that much more familiarity with other pitchers that he's going to be facing on a regular basis, hopefully, is something that benefits him, as well as just being more comfortable and more normal in a second year." Stanton said of his increased success when he sees pitchers repeatedly, "It's part of our muscle memory, it's part of our, my DNA, I guess you learn exactly how a pitcher releases the ball, you learn their tendencies, you learn them and their individual catchers' tendencies and how they pitch you and the lineup you bring to them. The more and more you see that, the more and more they run out of ideas to approach you, so that's kind of how I can explain it." Yankees right fielder Aaron Judge said of the differences he has seen in Stanton this season, starting with spring training, "Well, just in general, any time you're comfortable, you're going to play better. That's a big thing that I've noticed even coming in here, coming into spring training when I was in the minor leagues was having guys like CC (Sabathia) and Tex (Mark Teixeira) and Gardy (Brett Gardner) kind of welcome me in, made me feel comfortable and made me play better. Even though I was a little nervous, them treating me like a teammate for ten years always made it easier to play. 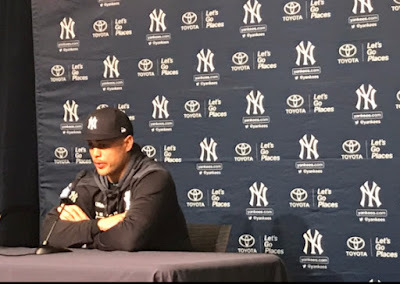 "So, Stanton coming in here, his second year, knowing what to expect, being around the city, the media, you know how intense every single game is and how every single game matters, just going to be a better position for him. He's going to go out there and play, he knows what to expect. It's just like I said before, it's like a practice test - you took the practice test, now here comes the real test. He's prepared and he's ready to." 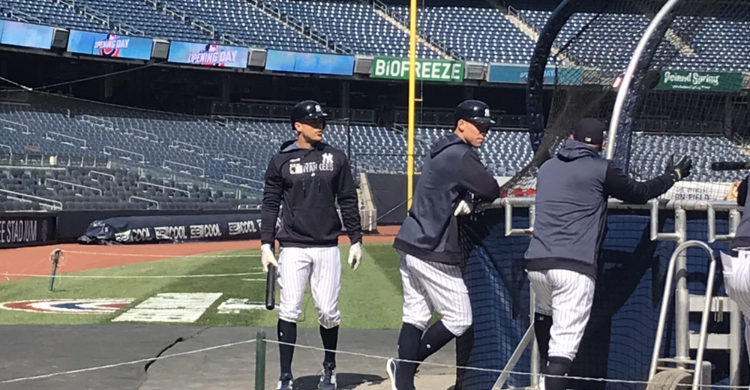 Stanton passing by Aaron Judge at the batting cage Wednesday. On how the increased expectations the Yankees have changes his mindset heading into a season, including Opening Day, "Little tough to go to sleep, you get the jitters going, you want to get things started. It's a team fight, it's a team expectation, it's great to be with a group of guys that we all want the same thing just as bat and we work with each other's talents to get there." The Yankees won 100 games in the regular season last year, and they have added James Paxton to the starting rotation via trade, re-signed starter J.A. Happ and reliever Zack Britton, and signed reliever Adam Ottavino and infielders DJ LeMahieu and Troy Tulowitzki. Stanton said of what he thinks of the additions, " We won 100 games last season and we're even better than we were last year, so that's great, a great thing to come into a season and, you know, just got to feed off it, we've got to go out there and put it together."